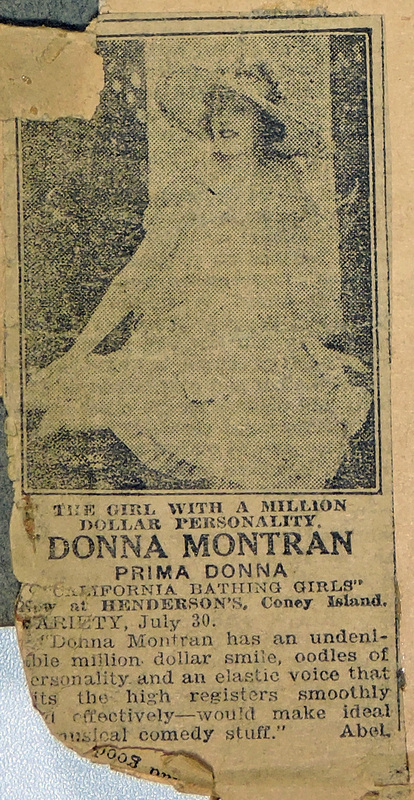 For this week’s Treasure Chest Tuesday, I’m looking at a clipping from the Donna Darling Collection. Now at HENDERSON’S Coney Island Variety, July 30. “Donna Montran has an undeniable million dollar smile, oodles of personality and an elastic voice that hits the high registers smoothly and effectively – would make ideal musical comedy stuff. The venue is Henderson’s, Coney Island. The show is the “California Bathing Girls. The Date of the clipping is July 30, 1920. This is a very confusing clipping. It clearly indicates she was playing in Coney Island on July 30th. However, other articles indicate she was playing at Moss’ Broadway at 41st at the same time. Additionally, other sources indicate Donna played at Henderson’s Theatre from September 6-13. So, I believe this write-up was wrong. Rather than being about a particular show, the article was intended to promote Donna for the personality she had and not advertise a specific show she was headlining.